I know Joseph W. Sarno has a minor cult following, but can’t say I’m much of a fan and Red Roses of Passion didn’t change that opinion, although Patricia McNair did make for a good lead with a plot that didn’t exactly capture my attention. Carla (PATRICIA MCNAIR) is fed up with her dull home life, living a prudish existence with her spinster aunt. After being introduced to a tarot reader, Carla quickly finds herself involved with a mysterious sect known as The Cult of Pan, who have learned to harness the carnal powers of roses to entrap men into sexual liaisons. But as Carla delves deeper into the occult world, the true and much more sinister motives of the cult start to become apparent. This release comes with a DVD Copy. Unfortunately, the only feature is an Interview (20:49; SD) with Sarno historian, Michael Bowen. 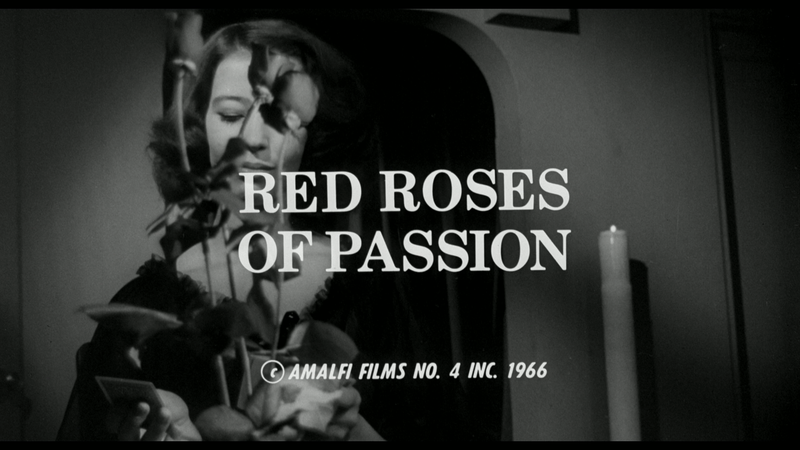 Vinegar Syndrome releases Red Roses of Passion onto Blu-ray presented in its original 1.85 widescreen aspect ratio and a 1080p high-definition transfer culled from the original 35mm camera negative scanned in 2K. This probably has never looked better as the detail was fairly sharp and black levels are deep. However, certain shots the whites appear blown out and while indeed it looks good, there are numerous scenes with scratches and some minor bouts of dust or dirt, these aren’t anything I’d say were distracting, but they are apparent. The disc comes with a DTS-HD Master Audio Mono track. This sounds alright nevertheless there were frequent instances of pops, hisses and other little flaws with the soundtrack where at times the audio does top out. This is nothing great but I can’t imagine it being any better considering the low production values. Overall, I know Joseph W. Sarno has a minor cult following, but can’t say I’m much of a fan and Red Roses of Passion didn’t change that opinion, although Patricia McNair did make for a good lead with a plot that didn’t exactly capture my attention. As for this Blu-ray release, the video/audio transfers are both good while the features are on the limited side with only an interview.